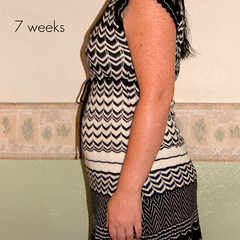 7 Weeks - Nekaro & Co. Weight gain: About 3 lbs. Cravings/Aversions: Yesterday I forgot the olives and it was like torture to not have any. Miscellanea: Still tired, taking naps. New prenatal vitamins aren't horse pills and haven't made me sick... yet. Development: Knee and ankle locations are shown as indentations, semicircular canals are beginning to form inside the inner ear, toenails are forming!